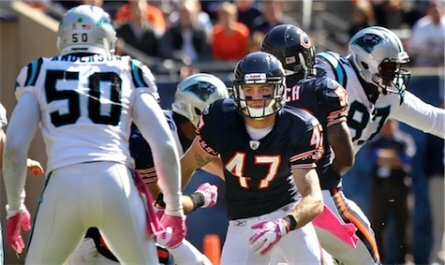 Chris Conte had a strong debut at the safety position on Sunday night football earning rave reviews from ESPN Chicago’s Jeff Dickerson and from the Chicago Tribune. Conte might want to send a thank you card to Jahvid Best for burning Chris Harris and Brandon Meriweather untouched for 88 yards on Monday night football which forced coach Lovie Smith to make a change in the secondary. Conte’s hard work on special teams and in practice contributed to his recent promotion. Kyle Boller is tentatively the Raider’s starting quarterback for now after a season ending collarbone injury to Jason Campbell will end his 2011 season. Boller came in relief and largely played the role of caretaker completing 8 passes for 100 yards holding onto the 24-7 lead the Raiders built. Boller is going to have to hold off pressure from the fan base to play Terrelle Pryor as well as a possibility of the organization going out and recruit David Garrard or Carson Palmer. If Boller can hang on to the starting quarterback position, we might have an all Cal QB showdown in Green Bay on December 11th. Andre Carter had two sacks and contributed to an outstanding game plan to confuse Tony Romo. The Patriot’s line play was its biggest question mark outside of wide receiver in last year’s loss to the Jets in the playoffs. Pro bowler Vince Wilfork handed Carter much complements after last weeks win over the Jets. Tyson Alualu has gotten off to a slow start in 2011 after a terrific rookie campaign. A nagging knee injury is to blame. However it didn’t stop Alualu from bull rushing LG Doug Legursky of the Steelers and dislocating his left toe this past Sunday. Thomas DeCoud was largely the goat following last Sunday’s loss to the Packers where he gave up the big 70 yard bomb to James Jones and missed out on a potential sack of Aaron Rodgers the play before. DeCoud worked hard to earn his starting safety position back after a benching in the beginning of the year. DeCoud did pick off Cam Newton this past weekend on the final play of the game to pad his interception count. Ryan Longwell , normally reliable and the only other Viking worth owning outside of Adrian Peterson at this point in fantasy, missed a 38 yard field goal near the end of the first half which pretty much eliminated any minute chance of a Viking’s comeback Sunday night. Longwell also failed to kick the ball into the end zone which lead to another Devin Hester kickoff return for a touchdown. Here’s an interesting article on how Longwell, along with his long snapper and punter, have been together for 6+ years contributing to what normally is a stable kicking environment in the Northern part of the country.